Experience fabulous lake and mountain views from this deluxe top floor waterfront condo - right on the shore of Kootenay Lake in Kaslo. This beautifully-furnished apartment sleeps four with 1.5 baths, full kitchen with all appliances, free Wi-Fi, HDTV, air conditioning, outdoor hot tub, washer/dryer in unit, and secure underground parking. Master bedroom, living room and deck all look out over spectacular Kootenay Lake and Purcell Mountains. A two-sided fireplace separates the living room and master bedroom. Enjoy dinner and a beautiful sunset from the deck, complete with gas BBQ. Then relax in the hot tub and gaze at the stars as the moon rises above Mt. Loki. Boat moorage is available upon request. Newly furnished and very comfortable, this third (top) floor condo is in a very peaceful waterfront setting with numerous activities nearby. Swimming, boating, golfing, kayaking, and hiking are all at your doorstep. 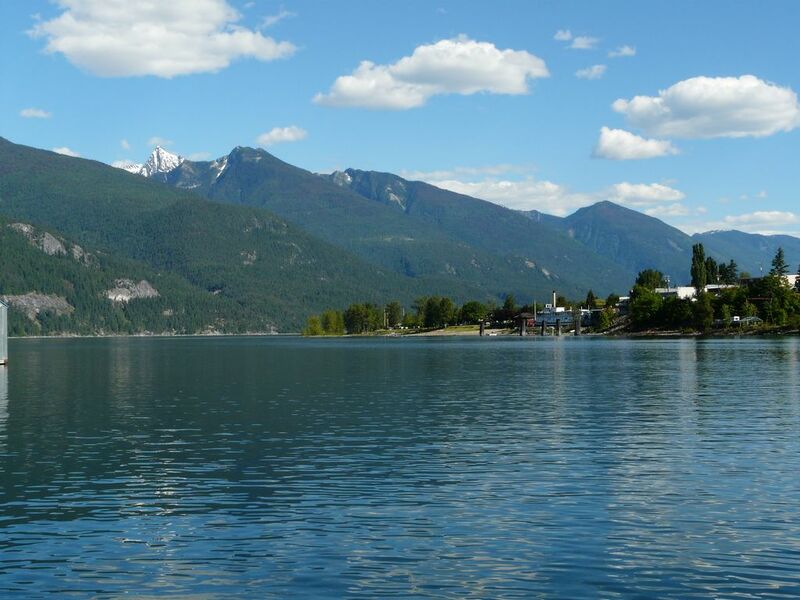 The quaint village of Kaslo is a three minute drive or a ten minute walk around the bay. It's a 15 minute drive to the famous Ainsworth Hot Springs and one hour to the thriving heritage city of Nelson. Also nearby is the historic mining town of Sandon, Lake Slocan and numerous opportunities for exploring, whether by foot, car, bicycle, or boat. Full kitchen with all major appliances, utensils, dishes, coffee maker, electric fireplace, flat panel HDTV, high speed internet, outdoor hot tub, washer/dryer in unit, beach, marina, secure underground parking, and deck with fabulous view. Now air conditioned. The condo was beautiful, Kaslo is a great funky town. Beautiful location. We had a great stay in Kaslo and loved the condo, clean, comfortable and well equipped. We really enjoyed our time here in Kaslo. Good places to eat and drink. The owner was friendly and accommodating. The condo was very well-kept and the air conditioning was an added bonus. Beautiful view of the lake, quiet neighbors and a private beach made it the perfect getaway for solitude. There's a full-size liquor store and an excellent grocery store just five minutes away. As a late summer get away, introduction to fall, this was a great location as it was just what I was looking for, quiet, yet convenient. This place allowed me to work, while I was also able to visit local sites, and friends in the area. I couldn't have asked for better communication with the owners who were receptive to questions, or concerns. I hope to return soon, as this property ahs everything bundled up in great amenities. This nicely appointed condo was perfect for my husband and my end of the summer getaway. A great location for day trips to all the sights to be seen, and places to visit, in the surrounding area. A secluded area, somewhat, with the development of the pub, etc. not happening, but made it a nice quiet place. Lovely view of the lake, mountains, and town. The owners were prompt with all replies, and arrangements for key drop off were as planned. We would definitely recommend this condo, and will certainly use this again when in the area. historic mining town of Sandon, Lake Slocan and numerous opportunities for exploring, whether by foot, car, bicycle, or boat.